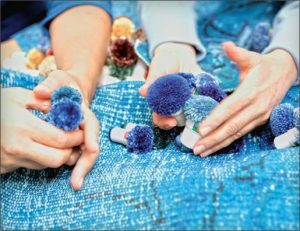 From development to conception, our PATCHWORKS involve an intensive 26-step process. The result is a meticulously-stitched story, combining tales from a diverse array of villages, homes, towns and regions. With this collection, experience a tale which travels from Thracian savannas to the misty Black Sea mountains, from Central Anatolian steps to the rugged Mediterranean sierras. Evolved and refined with a natural, cultural and ecological approach, our Patchwork Collections is an avant-garde and sophisticated collection transforming ethnographic artifacts of millenial old, affluent Anatolian carpet heritage into contemporary designs. 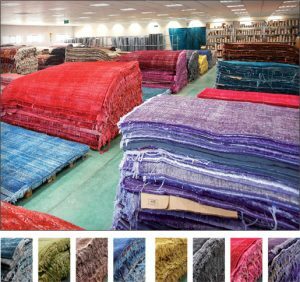 Deliberate intention to reinvent, reincarnate and most importantly upcycle copious carpet reserve of Anatolia through a completely human and environment focused perspective and to contribute to sustainability of her time honoured weaving culture formed the philosophy of the collection. While the colors of diverse, rich and exquisite nature of Anatolia as well as its antediluvian, eclectic culture and history are inspiring the collection, tranquility and serenity of modernism defined the concept. The origins of the collected traditional, hand-woven, aged,antique carpets of hand spun organic wool composition spread from fertile Thracian savannas to steep, sylvan, misty Black Sea mountains, from immense Central Anatolian steps to rugged, eminent Mediterranean sierras. Miscellaneous, colorful textures and patterns of collected carpets are attentively neutralized from their original state to create remarkable chromatic compositions while still holding the essence of their original features, while still whispering the stories and secrets of the homes, villages, towns and regions they come from. 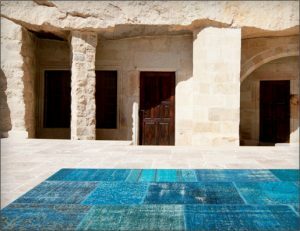 While overdying the neutralized carpets by eco-friendly process, the colors of gigantic scupltures of Hittites, elegant earthenwares of Phrygians, golden jewelleries of Lydians, magnificent wall and ground mosaics of Romans, stained-glasses of Byzantine churches, stone caravanserails of Seljuks and intricate tiles of Ottoman baths. 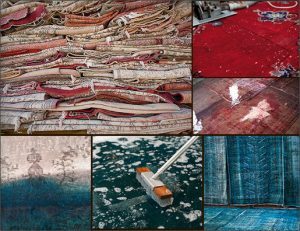 While the process may not be as demanding as weaving from scratch, processing and upcycling old and antique hand-woven carpets into patchworks is still a long, onerous and labour-intensive project, particularly if it is managed using a humanistic and environment-focused approach and with NO compromise on premium quality and standards. The story of any collection, or any product starts at our design and development department. Our fully computerised design office not only performs concept and design development services using patchwork patterns, choosing sizes to selecting specific dyes and stitching yarns, but also supervises the final processes of the productions with a meticulous master tailor. 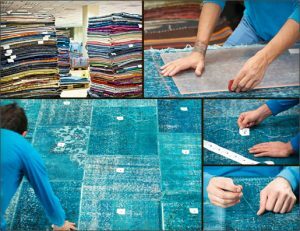 Starting with a collection of traditional, hand-woven, aged and antique carpets, each patchwork carpet passes through 26 steps of a completely humanistic and environmental-friendly process.